As featured in The Daily Mail, The Daily Mirror; ITV News, ITV This Morning with Amanda Holden and Phillip Schofield; BBC Radio 2's The Jeremy Vine Show; BBC Radio 5 Live Stephen Nolan Show, RTE's Ryan Tubridy Show & more. Order from all good bookshops worldwide (plus order online "click & collect"
At the age of 29, Diana Hill fell under a London train. In 7 seconds the tall, glamorous businesswoman went from busy woman of the world with everything to live for to double-leg-amputee, her life in ruins. Then it got worse. A few days after her accident, as she lay in hospital, traumatised and heavily sedated, she learnt via a newspaper article that the railway’s Transport Police were to interview “The Fall Girl”, as the Press had labelled her, with a view to prosecution. She had boarded a moving train, they said, and trespassed onto their railway line. Her fight for justice took five years and was, she declares with no hesitation, a more harrowing experience than having both of her legs ‘stolen’ from her. As any young, single woman would be, Diana was shocked to the core by the sudden, catastrophic change in her body image. What man would ever love her now? 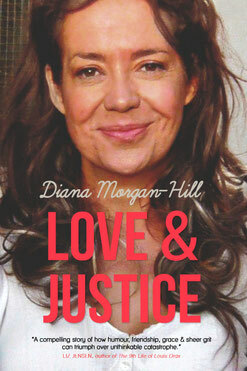 The issues surrounding sexuality and disability are explored here with stark honesty as she recalls her complicated love life, the High Court dramas, and the rawness of her pain amidst a turmoil of emotion, all told with tremendous humour, charm and heart. For Diana loves to tell stories. Especially true ones. A brutally honest, heartwarming memoir that shocks and delights in equal measure – when you're not crying for her you're laughing with her.